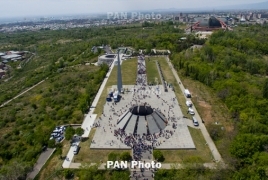 PanARMENIAN.Net - French President Emmanuel Macron on Thursday, October 11 visited the Armenian Genocide memorial in Yerevan to pay tribute to the memory of the victims of the mass killings, masterminded and perpetrated in the Ottoman Empire in 1915-1923. The French leader also visited the Armenian Genocide Memorial-Institute to learn more about the first genocide of the 20th century. Afterwards, Macron met his Armenian counterpart Armen Sarkissian and is now participating in the XVII Summit of La Francophonie. The Armenian capital of Yerevan is hosting the XVII Summit of La Francophonie on October 11-12.